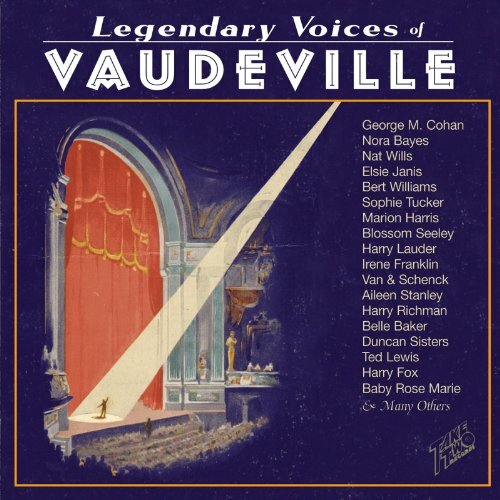 (2-CD set) A compilation of 40 tracks by 40 vaudeville singing and comedy acts. It is hard to overstate the importance of vaudeville as a source of entertainment during its heyday. It was today's equivalent to radio, TV, films, the Internet and comedy clubs all rolled up in one. Actually, it was the introduction of radio and talking pictures as rival sources of entertainment that led to vaudeville's eventual demise. Vaudeville was another term for variety with acts such as acrobats, jugglers, magicians, midgets, animal acts, dancers, comedians, bands and singers. These acts criss-crossed the country to appear on bills in vaudeville houses (Theatres) that were prevalent in towns and cities throughout the nation. As most types of vaudeville acts were entirely visual, this CD is limited to singers, instrumentals and dialog where sound is available. Artists presented here were major attractions and all represent for the sounds of vaudeville. Many like Nora Bayes, Elsie Janis, Sophie Tucker, Harry Lauder, Belle Baker and Van & Schenck were headliners. We have chosen selections that give the feel of a live stage performance and some are from actual vaudeville acts on early sound shorts. These include Be Your Age, I Wonder Who's Kissing Her Now, Love Baby and Strum My Blues Away. The height of vaudeville in the first quarter of the 20th century coincided with the rise of the recording industry, but that doesn't mean the eclectic entertainment form is well documented on record. Theater owners actively discouraged performers from making records, and many entertainers felt that recording material they performed would limit their stage success. Nevertheless, as time went on, more and more vaudeville stars began entering studios. Beyond the obvious enjoyment factor, the album also has historical value: many of these recordings are absurdly rare. If you have any questions about this product by Take Two, contact us by completing and submitting the form below. If you are looking for a specif part number, please include it with your message.